I was introduced to Kloverbox by @@MissJexie and I read her blog post with great interest I purchased November's box and was so WOW'd by it, I did a first. I prepaid for a 6 month sub. I never do that. I like to go month-by-month - no commitments. The december spoilers are up at kloverbox (I keep wanting to call it kloverfield - lol) and I think december is going to be an awesome month too! Kloverbox does not automatically renew, so you only purchase the subscription package that you selected – 1 month, 3 month or 6 months. Shipping is free and this sub is only offered currently within the USA. 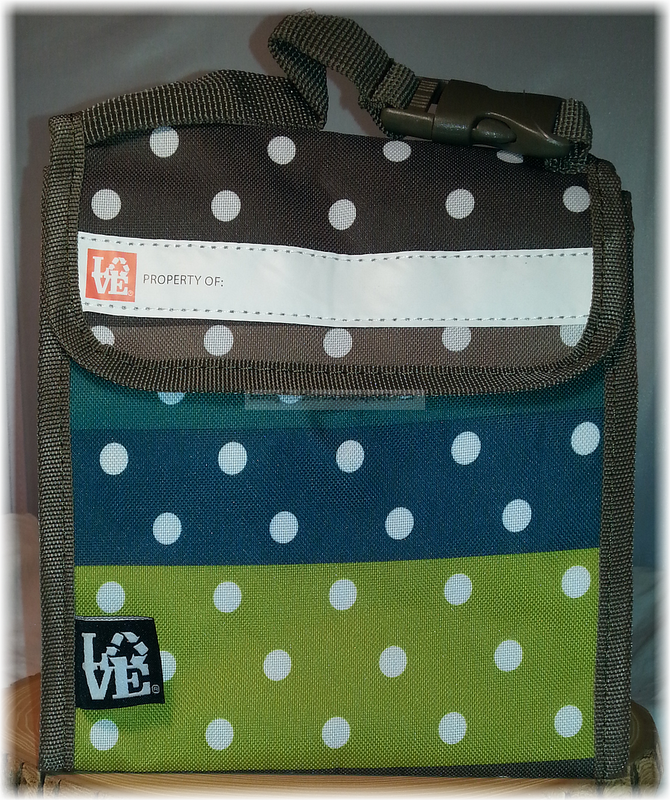 Love Reusable Bags – Mini Lunch Sack Full Size Value $13.95 This is so cute! I received a variation of greens ~ from olive, spring green, dark teal to blue-green ~ with polka dots. This style is called “Mod Dot”. I think it is adorable that it has “property of” label on it. This is a good sized bag ~ I can put my yogurt and fruit + snacks in here and bring this to work. 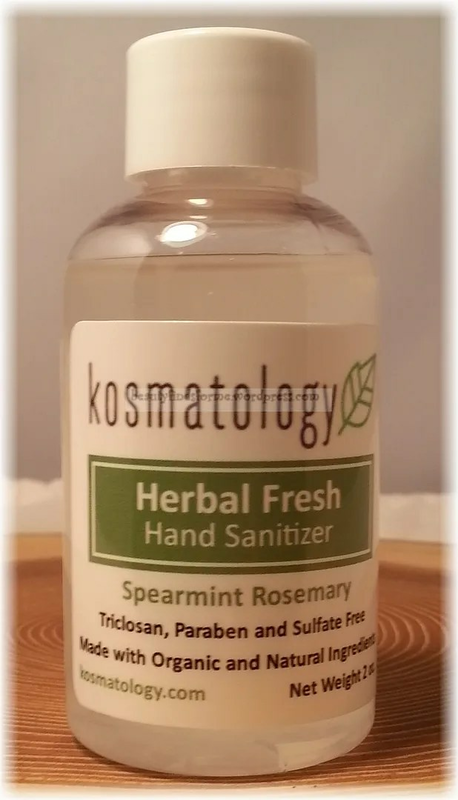 Kosmatology Hand Sanitizer in Herbal Fresh Full Size 2 oz Value $3.99 I really like this hand sanitizer ~ it isn’t made with thickening agents that make it into a gel and doesn’t have that all-pervasive alcohol scent. I really don’t use hand sanitizers because of that ~ but this one is more of a watery liquid and smells bright and minty! Very strong mint, in fact ~ which I do love. Herbal Fresh is the Spearmint Rosemary scent. There are two other scents ~Botanical Bliss (Lavender Eucalyptus) and Goody-Goody Grapefruit (Grapefruit Clove) ~ both sound very wonderful and I will be purchasing a set of these for myself. Product Description: Our Hand Sanitizer is free of the harmful chemical, triclosan, and has no chemical thickening agents. Although it contains ethyl alcohol to kill germs, it also contains organic glycerin to rehydrate the skin. Organic essential oils are added to create amazing scents and provide additional anti-microbial effects. Jolly Oak Dark Chocolate Coconut Raisin Granola Single Serving1.63 oz Value $2.50 Chocolate and Coconut ~ two of my favorite sweets ~ I love dried coconut and finding it in this snack-o-roony is fabulous! The granola contains puffed kamut (Khorasan wheat) and this is not too sweet, but just sweet enough. This is a great treat and has flaxseeds and oats. Product Description: Dark chocolate’s antioxidants pair perfectly with the clusters of coconut, raisins, protein packed pumpkin seeds, healthy heart flaxseeds and fiber filled oats. We added the superfood kamut for a crunchy texture that melts in your mouth. Kamut has been found to be a good substitute for wheat, because it is easier to digest, a good source of energy and is rich in minerals such as magnesium, potassium, zinc and vitamin E.
Small Beauty Keys Cocoa Mint Hand Made Soap Full Size 3.5 oz Value $5.00 It sounds like Kloverbox will feature an Etsy shop monthly, which I think is fantastic! I love supporting small businesses and this soap is made by a company in Charlotte, NC. 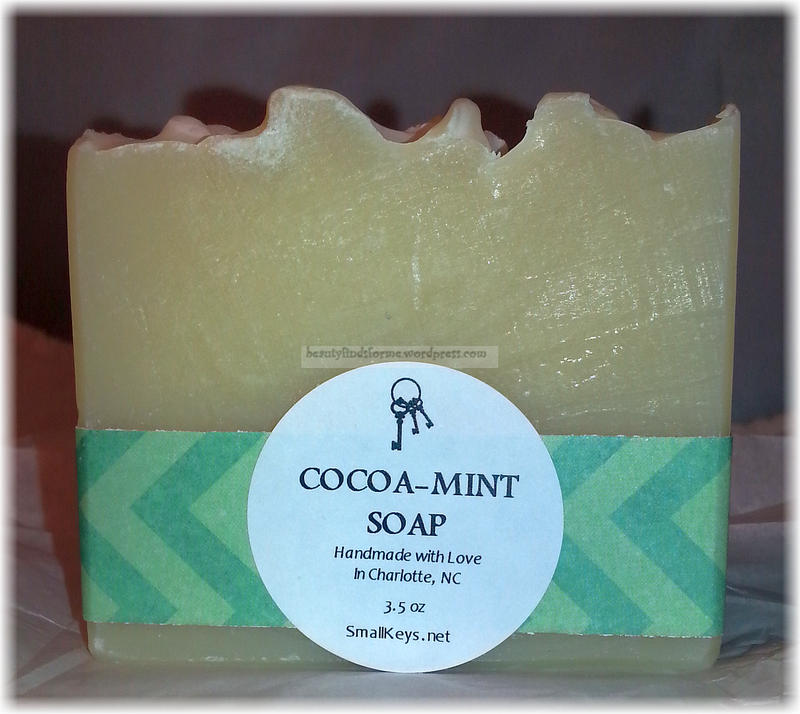 It is made with Cocoa Butter (the cocoa part) but the scent is pure mint. This looks to be a very rich bar of soap and I love the scent. This soap is vegan and all natural. They have other scents that sound rich and unusual ~ Tea Tree & Sage, Smoked Amber, Lavender, Vetiver & Patchouli, Cedar Wood & Orange Coffee, and others. These soaps will make great gifts and they are inexpensive! They do not contain fragrance oils, detergents or artificial colors. Product Description: Cold process soap is made through traditional soap making methods using lye, oils and butters. “Cold process” refers to the fact that no heat is added to the process to speed up saponification. The lye creates a chemical reaction with the oils/butters and soap is the byproduct of the chemical reaction. It actually gets quite hot despite the name. The Wonder Seed – Hemp Hand Cream in Spring Lavender Full Size 2.4 oz Value $12.95 I am glad to see more products made from hemp. No, it isn’t pot. Hemp has gotten a bad name in the last century or so, because people associate it with marijuana. But it wasn’t like that in the past ~ It has been cultivated for 12,000 years as a major food, fuel and fiber product. America used to grow hemp and it was used to make rope, fabric and paper and in some states, you had to grow hemp and if you didn’t, you would go to jail! Back in the days of King Henry Henry VIII , if you were a farmer, you were encouraged to grow hemp, as it was used for their Naval Fleet ~ from rope, riggings and sails. That is how valuable that resource is. Hemp is an amazing renewable resource and it can be used for anything ~ I’ve read about how “plastic” can be made from hemp and Henry Ford and Rudolph Diesel used hemp to create biomass fuel ~ and this in the late 19th and early 20th Century. So, I am really happy to get hemp products ~ they are few and far between, but I do think that the future will show a resurgence of hemp products. This is a hand cream made from virgin, organic hemp seed oil and has a light lavender scent. Product Description: Our hemp seed oil hand cream is superfood for your skin! The non-greasy formula quickly absorbs to moisturize and heal even the driest of hands and feet. Nutrients promote elasticity, reduce the signs of aging and protect the skin. Scientifically proven as an all around healing agent, hemp seed oil can relieve the symptoms of even the driest skin. It is easily absorbed by the skin and is one of the world’s richest sources of essential fatty acids (EFA’s) which are at an optimal balance for human absorption. Our hand cream includes grape oil which is very rich in polyphenols that protect the skin from environmental damages. And, not to brag, but this formula won the 2009 Natural Health Magazine Beauty Award for Best Hand Cream so we’re not the only ones saying it’s great! 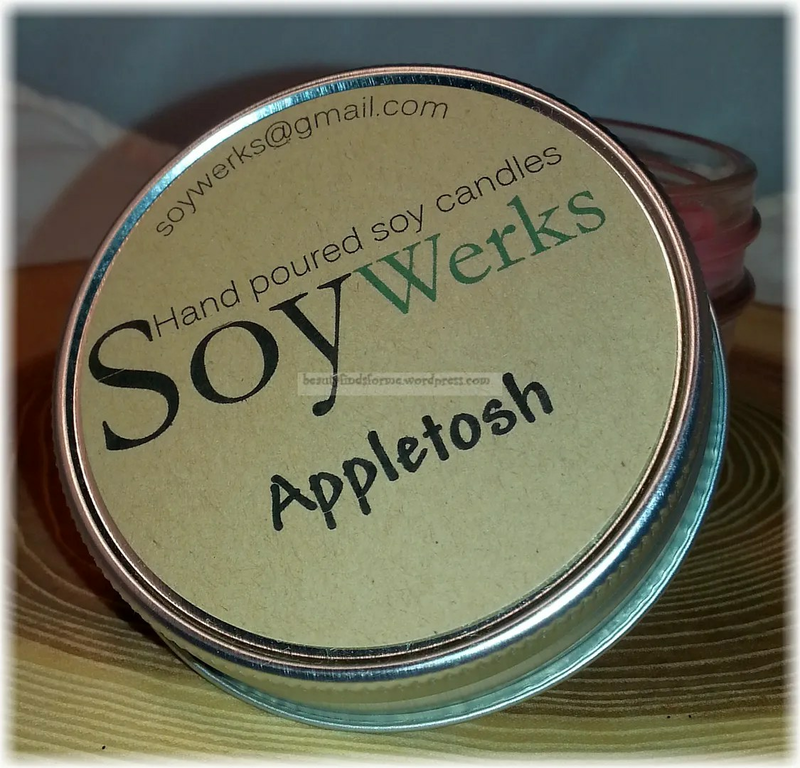 SoyWerks Appletosh candle Full Size 3 oz Value $5.00 I am in heaven with this box! First mint, then hemp and now a candle in a wonderful MacIntosh apple scent! 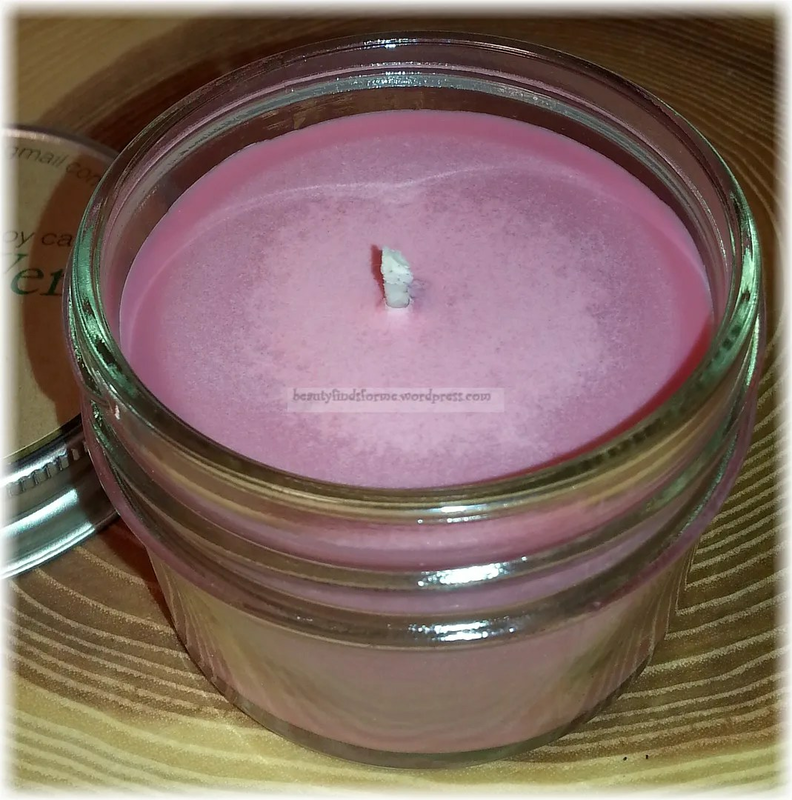 This is a beautiful rose colored candle in a sturdy glass jar. Soywerks has other scents, such as Coconut Lime, Mango Tango, Warm Vanilla Sugar, Hansel & Gretel (vanilla, graham cracker and cinnamon!!). SoyWerks uses 100% soy wax, vegan and is handmade in New Jersey. : Appletosh is a classic year round scent that smells like it was just picked from the Macintosh tree itself. This is a scent that you didn’t didn’t know that you needed! Great for medium sized rooms. Lavina 100% Pure & Organic Argan Oil Sample Size 1.7 mL Value $2.15 This is a nice sample size of Argan oil. You can use this for your skin and hair as it is moisturizes and conditions. I use this oil for my cuticles and rough patches of skin, like my elbows and heels. This is a cold pressed oil and is more suited for dry and sensitive skin types, which is why I do not use oil on my face. oil’s natural composition makes it suitable for growing and repairing dry, damaged or brittle hair. It will strengthen your hair strands, restore your luscious locks and bring back that beautiful shine to your hair. I found this yesterday and have to share. If you Google kloverbox review several bloggers have 25% off coupon codes. That brings the cost done to under $17 per box on a 6 month sub. I haven't pulled the trigger yet, but it seems like a great deal. So this month brought me four full sized items!! 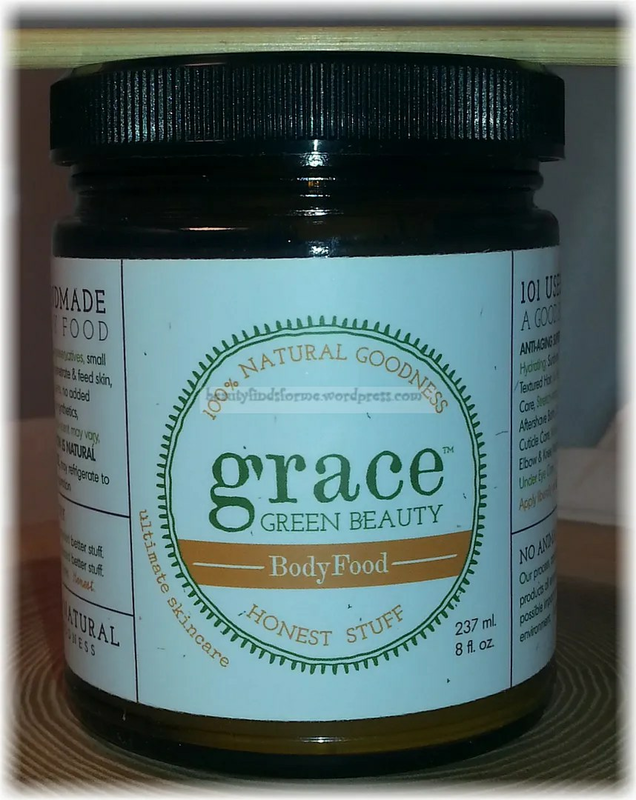 Grace Green Beauty Body Food Full Size 8 oz Value $34.90 This is a huge jar of body butter! 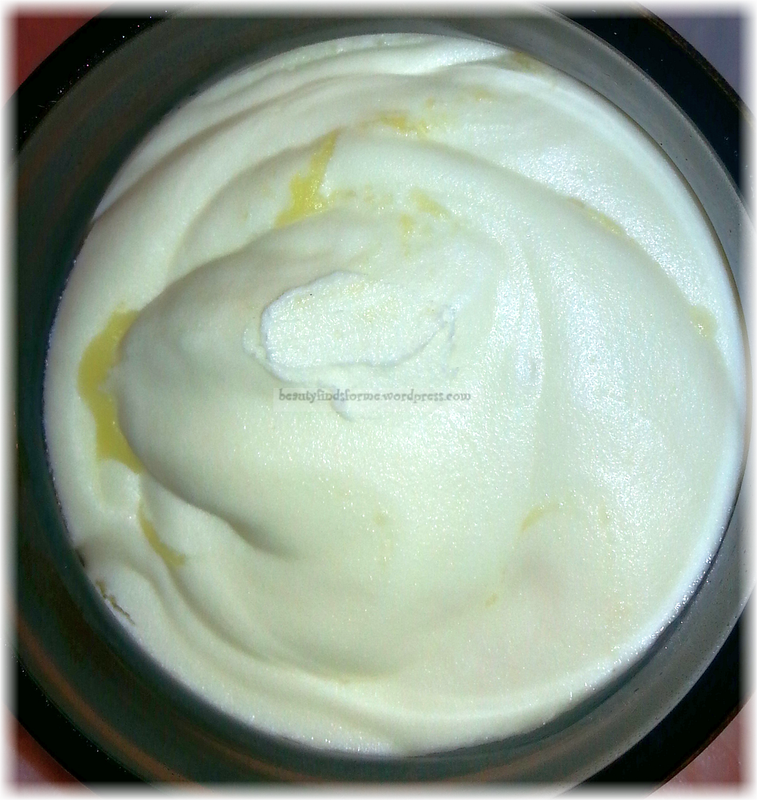 This is a thick body butter that is made with organic raw, cold pressed oils and butters. This has a slight scent of patchouli, but it is not overpowering. Very thick, moisturizing and it can be used not only on your skin, but as a hair treatment as well. There is also a stick included, as the oils can separate. Those yellow swirls in my body butter are normal ~ it is so cold right now, that everything is pretty solid, but it looks when it thaws out a bit, it will separate. This is the perfect time of year to get such a hydrating body butter! Product Description: Say goodbye to dry skin. Feed your skin with this head to toe anti-aging super food. Made with an array of raw, cold pressed oils and butters. Molecules small enough to penetrate skin. Experience skin rejuvenation at the cellular level. Hearty, earthy scent. How To Use: Apply liberally. Use the excess on hands to nourish and tame the ends of your hair. Separation is natural. Stir and use! Befine Food Skin Care Lip Serum Full Size .5 oz Value $18.00 I have used Befine products before and I do like them a lot. I am also a lip balm junkie, so having one made from BEETS really intrigues me. I never had one made with beets before! 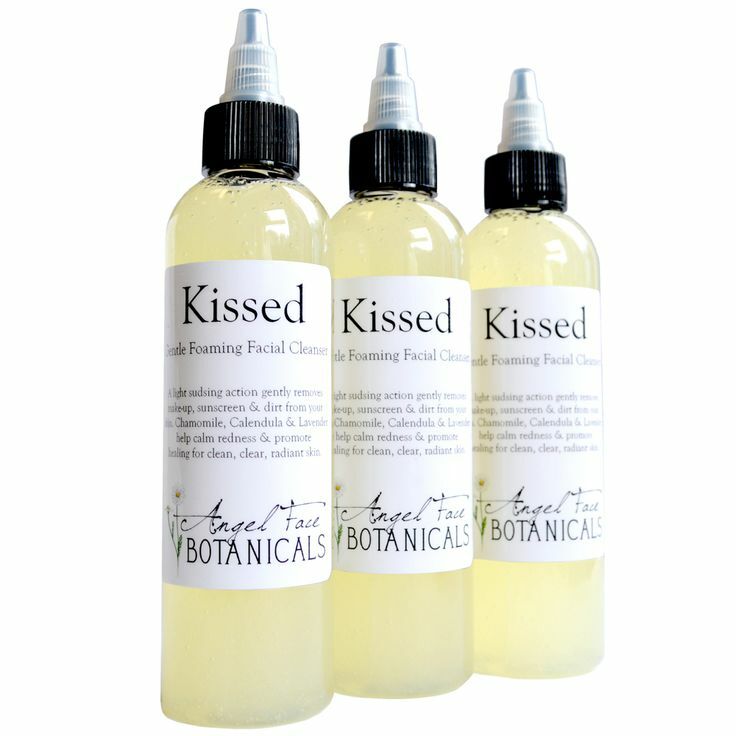 This is actually a lip serum/treatment which uses plant peptides to help firm and plump up lips while the chamomile helps smooth and soften fine lines and wrinkles. Ingredients: Palm Peptides,Chamomile Oil,Safflower Seed Oil,Beet Root Extract,Bixa Orellana Seed Extract. 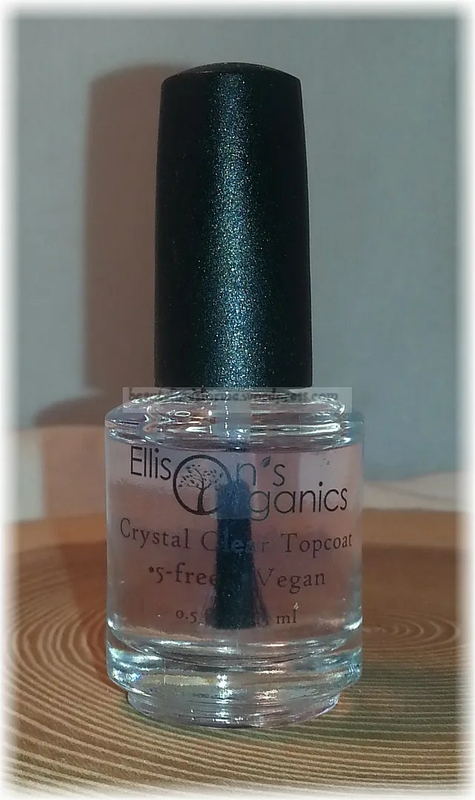 Ellison’s Organics 5-FREE Crystal Clear Top Coat Full Size .5 oz Value $6.00 Confession time. When I saw this brand as a spoiler on Kloverbox’s home page, I went to check it out. This is an etsy shop (again, I love it when companies feature etsy shops) and I saw that this vendor (a very nice lady, btw) had a Doctor Who Collection. I am a huge Doctor Who fan…going back to the Tom “all teeth and curls” Baker days. This is a top coat, of which I can always use. I love that it does not yellow and does not shrink my glitter nail polishes! Product Description: The perfect top coat! Finally, a clear top coat that is not only super shiny, but also 5-free. This professional grade top coat does not yellow and does not cause shrinkage with glitter nail polish! I recommend 1-2 coats for a shiny, chip-free result. Ellison’s Organics is committed to providing you with quality nail polish products with the lowest amount of chemical ingredients possible. We chose this 5 free top coat because it provides a beautiful shine without yellowing, it goes on very smoothly, and because it is 5 free and cruelty free, you can feel good about using it. 5 Free Top Coat (no DBP, no formaldehyde or formaldehyde resin, no toluene, no camphor). OH MY GOD! I love that lip serum. It's my favorite. @ChullBird do you sub to kloverbox? No, but I received the lip serum in a lip factory box a few months back. It's one of the few things I wouldn't mind getting repeats of. This looks like a really awesome sub though. @@biancardi - Weird question, could you let me know what town/state this shipped from? I'm leaving for my Mom's on Christmas Eve and am trying to figure out which packages are where (and what I need to do to get things held, if necessary), and for some reason most of the shipping company trackers don't list the shipper, just the town shipped from. Thanks! @@biancardi Hmm, that one isn't even one of my mystery options. Weird. Thanks for looking it up for me! I signed up for kloverbox December 4th and just saw December's box and I love it! Sadly I just noticed when you sign up they start your box with the following month. So sad I have to wait until January. I signed up for a 3 month to start in February, so I'm set until April now. These boxes look great to me. I love makeup but am getting pretty overstocked, so I love the candles, scarves, room spray etc that this box has a history of sending. and something from Pella Beauty - not all of this, of course...I think we are just getting one of them. Wee! I'm so excited for both months! That shampoo is perfect for a valentines day box! I was way too overloaded with skincare to try the Palmetto Derma product I got from Boxycharm, but my mom said she absolutely loved it! I might just give this one a try when it comes in the January box! I looked at their pinterest board and they have this item just pinned...I hope this is in Jan's box!! I love the way they curate this box. The mix between small businesses, etsy shops and more popular brands. I used to be a HUGE fan of etsy beauty companies until I started blogging and got overloaded with stuff, so kloverbox has been an awesome way for me to try completely new-to-me companies. It makes me so excited because so many boxes have overlap when it comes to the products and brands they feature. I know, Miss Jexie! I love how they have been curating their boxes. 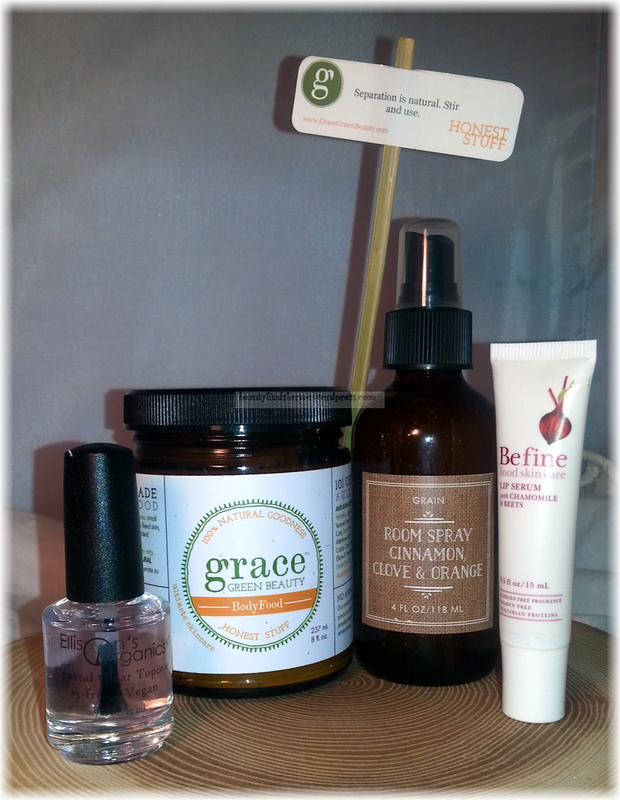 I am really into natural/organic serums right now because I started derma-rolling, so I really do use them a lot! I am very excited about this sub - they beat the pants off all of my other subs right now. @biancardi @MissJexie Maybe we should have a thread about dermarolling somewhere? I just learned about it a few weeks ago and am so curious about it. Mildly terrified, but so very intrigued. Also, this sub looks so nice! I'm honestly rather indifferent whether something is natural / organic / eco, but the types of products and the ingredients are so appealing. And so nicely curated, too. This is one of my favorite subs and have been subscribing since the second box. The owner is wonderful! I love the spoilers @@biancardi posted. I received Pelle Beauty beauty oils in a previous Peit Vour box and a Goodebox. They are wonderful. I ended up ordering a few full size oils from them. I'm wondering if we will be receiving Bloom since that is the newest oil. I've tried the PalmettoDerma eye cream before and liked it. I am looking forward to trying their serum. btw - I asked on pinterest to kloverbox if this was in jan's box - and they said it is! Here's the spoilers for January! And good news for anyone looking for a TRULY gentle facial cleanser: This one tested at a PH of 5.5 for me, which is exactly what I've been looking for! And it's only $11 retail, which is more than doable for me if I like it as much as I think I will! you are so lucky to get yours this early! I am still waiting. sigh. I was hoping it would show up today but it hasn't. Do they send you tracking or is it a surprise? I could use that laundry powder right now! haha I am almost out of soap and then I saw this... I am really interesting in the cleanser and healing salve. I usually get mine later than most, although it showed up early this month. It looks like they went out in two batches, but I think that on their facebook they said most of them went out on Tuesday!